MyMiniFactory is now the first 3D content platform to integrate Facebook’s new 3D sharing feature. The feature allows users to share designs from MyMiniFactory directly to Facebook. Users on Facebook can interact with 3D objects posted by moving and rotating them directly from the newsfeed. The move is another step towards engaging a far broader audience with 3D content, content creators and 3D printing. 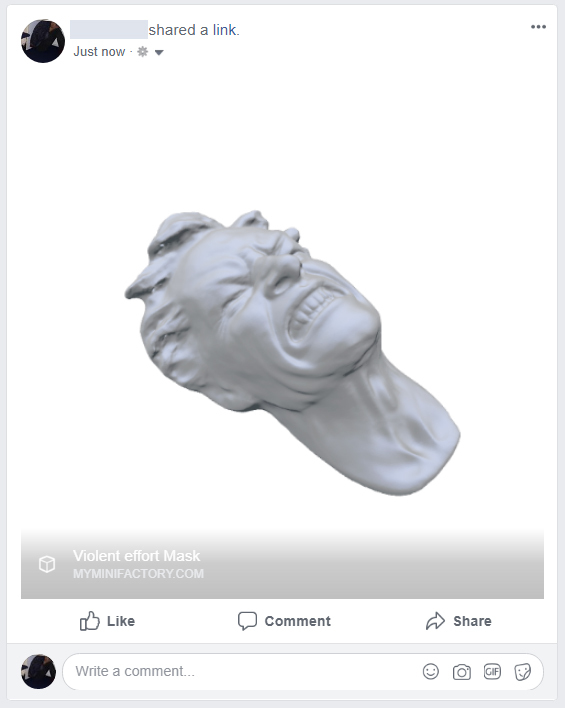 Sharing to Facebook from MyMiniFactory is straightforward. Users click the Facebook logo under the “object parts” header when viewing a 3D model on the 3D model sharing site. Sharing to Facebook from MyMiniFactory. Image via MyMiniFactory. Facebook enabled support for GL Transmission Format 2.0 files, glTF 2.0, several weeks ago in February 2018, making it easier to share 3D designs on the platform. The format makes it possible to display 3D models with Physically Based Rendering (PBR) shading and lighting within Facebook posts. A post shared to Facebook from MyMiniFactory.